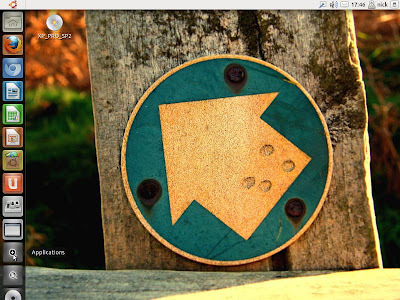 technick | tips for the rest of us: Ubuntu 11.04 installation success! I have installed Ubuntu at the office computer, this one within Windows as I have some applications that I need for work that runs only under Windows. However, I seem to have come upon a stumbling block as I am able to connect and browse the Internet, but the Software Center is not able to download apps. Back here at home, I had better success. Since I have a 4GB thumb drive, I created the Installer plus copied the ISO in this drive as well, so it is in the same place as wubi. That worked perfectly fine. I installed Ubuntu alongside Windows for this occasion and have been playing around with it for a couple of days now. I have installed Chromium as my preferred browser, and I am currently using this on the Ubuntu platform to write this blog entry. One of the things which I found confusing with Unity is the GUI itself. 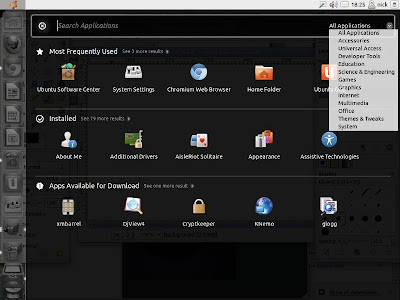 After some hit and miss, I discovered that the Applications installed in Ubuntu can be found by pressing the ... Applications button. Well, the button wasn't really that apparent! It had nothing but a plus sign on it. It didn't help either that the button was at the lower section of the vertical bar. Click on Applications, then click on the drop-down menu at the top right to view installed apps by classification. And by default the Control Panel was not in the menu bar either. I accidentally came across it when I searched for monitor controls under Applications. But once I found System Settings again, I tried to see if I can drag it onto the vertical bar to add it. And it did. Good thing. So far my foray into Unity has been good. Though I think I will have a go at Gnome as well which, judging by the experience of others, is a much better interface.